Had an wonderful day-out with my parents we all really enjoyed it. The van was comfy and air-conditioned, the vineyards and port/wine were lovely, boat trip was good, partly we were so lucky with the weather and the guide was friendly. Maybe the lunch could be improved a little. But all in all superb, thank you for everything! 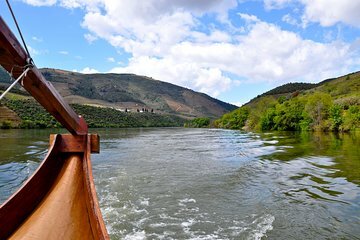 A very concise yet encompassing introduction to Douro Valley, with tasting in 2 separate places, lunch and a short boat ride. The landscapes are magnificent. Our guide Tiago was knowledgeable and easy to talk to, and spoke very good English. 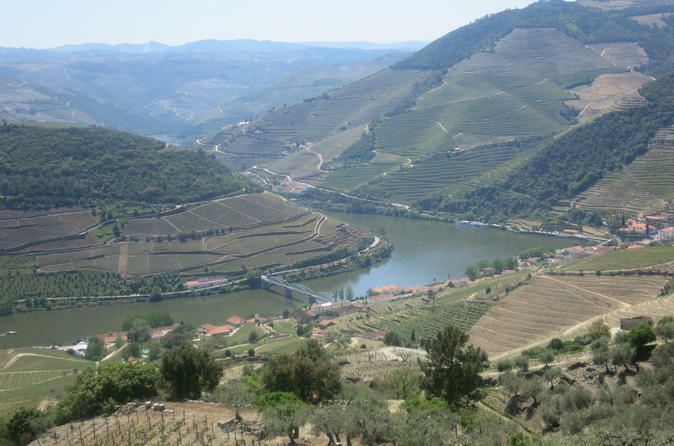 It is definitely worth escaping Porto for the beautiful scenery of the Douro Valley with the added bonus the Douro is usually a few degrees warmer than temperatures in Porto. Tiago was an excellent guide - very knowledgeable, polite and professional. The drive took 1.5-2 hours. We were in a small group in a minivan which was ideal. Pick up from the hotel was on time. We went to Quinta da Roeda Croft's vineyard for a tour at 10.30 where you learned more about the process of producing port wine, followed by a tasting of pink, tawny and ruby port. Lunch was at 12pm in Pinhao and was excellent - there was plenty to eat and drink. There was a choice of fish or meat you order earlier in the day, plus bread and cheese, dessert, hot drinks and wine. After lunch we went to a smaller family run Quinta above Pinhao, Quinta Do Jalloto, who produce their own wine, honey and olive oil - which was incredibly tasty. Olive oil and honey were available to purchase from 5 euros and olive oil was available in 100ml sizes for those needing to fit it in cabin baggage! The views were wonderful. There was plenty of time for both tastings, which were both set in lovely peaceful surroundings and there is no pressure to buy. The one hour boat trip from Pinhao was also very relaxing. We were back in Porto by 6pm. An excellent day which I would recommend. The tour was really great. Guillermo was our guide and he really knew the region. The pacing of the tour was good too. It is a bit slower paced but that allowed us to take in the views as we enjoyed the wine and port. My only wish was that the tours at the vineyards had a bit more to see. They were less about the vineyard and the making of the product and more about the tasting. We were collected from out hotel at 8:10 a.m. and enjoyed a full day touring the Douro Valley experiencing the wines, food and beautiful scenery. The van was comfortable and Tiago was an excellent guide with an in depth knowledge of the area. The small group of 7 people was also a plus. This particular trip had been recommended to us by friends from New Zealand and I would thoroughly endorse that. It was a beautiful day trip with a fine group of people and the perfect guide. A very comfortable vehicle, a knowledgeable and pleasant driver and tour guide, lots of delicious Oportos and vineyards visit and sightseeing made up for a perfect tour. A faultless tour - if improvement is necessary maybe a photo stop or two while on the heights of the valley would be good. Without doubt the best tour ever take. Our guide, Guillermo, gave us lots of interesting facts and was very friendly. The views were amazing and the vineyard tour sublime. We greatly enjoyed the boat trip on the Douro and the surprise glass of port and dried fruits perfectly complimented the occasion. The excellent meal was accompanied by copious amounts of wine. The tour then took us to a small wine producer that also produces lovely honey and olive oil. Again the view from the tasting area was amazing back up the river. A fantastic tour and an excellent guide. If you only do one tour from Porto this should be it. We really enjoyed our day out in the Douro Valley. Our guide was on time with our hotel pick up, friendly and happy to answer any questions. On the tour we visited two quintas, had a delightful hour boat tour and a tasty Portuguese lunch. This is a full day as it is a long drive from Porto, but well worth the time. Comfortaaable transport with our driver/guide fluent in English. He di everything to make our day enjoyable. Go and enjoy the scenery and wine!